I adored Night Study. It is a truly fantastic book that adds even more depth to an already amazing series. It has left me thirsting for more and I can't wait for the next book! 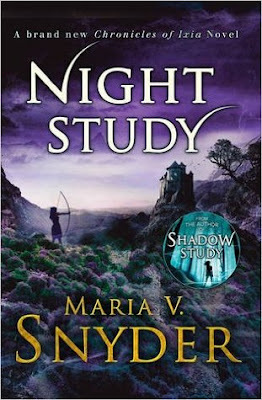 In the meantime, you can check out my review on Night Study HERE. However as part of the Night Study Blog, I am lucky enough to have the amazing, Maria. V. Snyder here on the blog today to talk about her inspirations. 1) when your writing do you take any inspiration from music, or do you prefer to work in silence? MVS: I do listen to music when I write. When I first started writing, I didn’t as I would get distracted and, instead of writing, I’d listen to the lyrics. When my dog died, my office was way too quiet (she snored), so I started to listen to classical music. However, it wasn’t conducive to my fast-paced plots so I switched to pop songs. 2) The study books have a truly amazing cast of characters. Are any of them loosely based on real people? Any quirks or habits, perhaps even some one liners taken from friends or family? MVS: There are a few characters loosely based on real people. Rand the cook in Poison Study is based on my brother-in-law Randy who loves to cook. Margg is a person I worked with long ago and hated. Janco’s energy comes from an equally energetic friend on my volleyball team. And I based Opal’s mother in the Glass books on my own mother (shhhhh don’t tell her!). I’ve stolen a few quirks and habits from my friends and family, but I won’t name names as I don’t want to get into trouble ;). Also when I meet people, they are always a potential source for either a character or the name of a character as I’m always looking for good names to use. 3) similarly are any of the settings inspired by actual places? For instance the commanders castle in Ixia, is that based on a real castle or time period? MVS: Not in the Study and Glass books. I purposely didn’t set my story in a certain time period because I didn’t want readers to say, “They didn’t use the word “intell” in the middle ages.” Or “They didn’t have needles in the 17th Century.” It’s a true fantasy world. 4) How do you come up with such fabulous plot lines? Does your inspiration come from quiet walks in the woods? while cooking dinner? Or does everything just flow from your fingers when sat the computer? MVS: I’ve sparked on story ideas from a variety of sources. I get ideas from the newspaper, magazine articles, books, TV shows, and movies. It can be from something that comes up in conversation, from dreams, or from something my children say or do. Traveling has also sparked a number of ideas. I tend not to lack for ideas just time! However, the details and characters of a story’s plot develop as I write. But I do my share of zoning out in the shower and while I’m otherwise engaged. I don’t think a writer is ever “off.” We’re always open to the world around us, just in case. 5) Can you share with us which authors fired up your love of fantasy? Who are your role models? MVS: The first fantasy book I read was On a Pale Horse by Piers Anthony, and then I read his Xanth novels, starting with A Spell for Chameleon. Those books hooked me on fantasy and I tore through everything I could find from Ursula K. LeGuin’s Earthsea trilogy to LOTR. As for my role models, I really enjoyed reading Barbara Hambly, David Eddings, Glenda Larke, Mercedes Lackey, and Marion Zimmer Bradley. They inspired my strong female protagonists. 6) When you were pursuing a career as a writer, what or who was your biggest driving force pushing you along the road to publication? MVS: I started getting serious about my writing when I was home raising my children. I’d quit work as an environmental meteorologist to stay home and during that time I wrote my first novel, Poison Study. I thought it might be good enough to be published and I really didn’t want to go back to work when my youngest went to school full time. So I was determined to submit the book to every publisher! My husband was also very supportive and was happy to be a single parent a few weekends a year so I could attend writing conferences and take writing classes. Without him, I wouldn’t be an author. 7) finally, on the topic of inspiration, is there anything else you would like to add? Such as do you believe in waiting for the muse to strike? Or will you write everyday, even if it feel like each word is tearing out pieces of your soul? MVS: I use to write when the muse struck, but having deadlines turned me into a daily writer. I started keeping track of my daily word count and I noticed that whenever I took a few days off from writing, my numbers dipped when I returned to my computer, but as the week progressed, my numbers increased. It’s like a cold engine, when you first turn the key, it chugs and isn’t very efficient, but when it’s warmed up, it runs smoothly. I write five nights a week and take the weekends off unless I’ve a deadline looming. And I will admit, some nights it is very difficult to get words onto the page and I have to accept it’s a bad night and go to bed early. Thanks so much Maria for your time today :) Be sure to check out the next stop on the tour tomorrow over at The Book Binge. Nice! 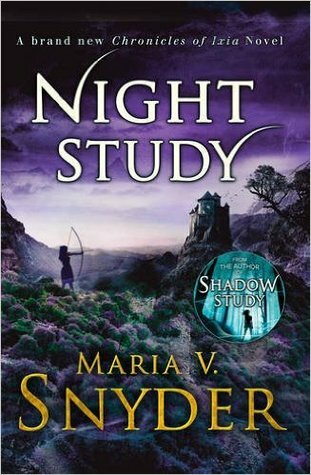 I love Maria's books and always love hearing how she gets her ideas for her novels! Great post! My story changed with my music... not always a good thing! Thanks for being a part of my blog tour! I'm so glad you enjoyed the book! Whispering Words... has completed her goal of reading 1 books in 2018!